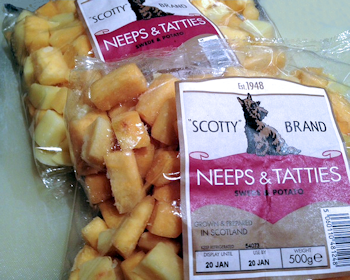 An alternative Burns Supper – Slow cooked mince, neeps and tatties. An alternative Burns Night Supper – Slow cooked mince, neeps and tatties. In Scotland, we all know it’s the birthday of the Bard coming up. If you don’t know who – it’s Rabbie Burns, and we celebrate it on the 25th January every year, so Friday night will be haggis night in many households around the world. Robert Burns was a poet who is now looked upon as being the national poet of Scotland. His birthday is celebrated by both Scots and Non Scots worldwide. Our children will have Burns celebrations at schools, and many a charity function will be held in his name on Friday night. I’ll never forget a local poet giving a lament to the haggis a few years ago at a special school, where the lady poet was swinging huge kitchen knives above her head before she ripped the haggis open ceremonially. A logistical nightmare, our knives had to all be locked away forever after that one. At least with me being there, I knew where the new-found fascination for knives came from. I pity the parents of other kids who had no idea why their kids would suddenly have taken to brandishing knives above their heads like daggers with a swagger! The traditional dish is haggis, neeps (turnips) and tatties. There are vegetarian versions of haggis, but not everyone likes the meat or the vegetarian options as they can be quite spicy. As an alternative, this weekend, we did a trial run of slow cooked mince with meat from Andrew Gordon Butchery and Fine Foods and the new Neeps & Tatties from the Scotty Brand range. As always in our house – anything from the slow cooker gets the thumbs up from me for ease – and always tastes fabulous. Switch on the slow cooker to high to warm up. Brown the mince with the chopped onion on a thick bottomed pan. Add the mince and onion to the slow cooker. Add in the neeps, tatties and carrots. Add boiling water to almost the top of your ingredients. Add a teaspoon of salt and a pinch of pepper and a stock cube, or stock pot if you prefer a stronger taste. Put the lid on and leave for 8 hours on low, or 4 hours on high. If you want to thicken your hotpot, half an hour before the end of cooking, mix up cornflour with cold water and mix to a smooth paste. Add to your hotpot and fold in until it thickens. If you over thicken, add a little boiling water to fix it. This is a great idea, now everybody can join Burn’s Night celebrations! Enjoy if you try it. It was fab. I suspect I’ll make this many times over.